The Icelandic retail investor Baugur, which owns stakes in Hamleys, House of Fraser and Iceland supermarkets, has asked for protection from creditors. Baugur took the action after its main bank ended discussions about a potential restructuring of the group. The bank has also applied for Baugur's UK arm to be put into administration. 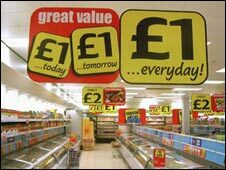 The UK retailers it has interests in are still trading as usual. But the move means stakes in some of Britain's best-known retailers may be sold. Sir Phillip Green has told the BBC he is not currently interested in any of the UK retail arms of Baugur. "If they come to us, then we'll have a look at it, but we're not going to them", said Mr Green, referring to the companies' administrators in the UK. Last year he flew to Icelandic capital Reykjavik to buy stakes in some of Baugur's retail chains but failed to do a deal. 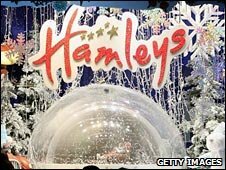 Meanwhile Hamleys, of which Baugur owns 63.7%, has said that the application for court protection will have no direct impact on its business. "Hamleys continues to operate successfully as a self-funded stand alone business with no shareholder funding requirements for either short-term operations or long-term development," the toy retailer said in a statement. Others have stressed that Baugur is a minority shareholder. "During these difficult times, it is important to clarify the independence of House of Fraser and to emphasise that Baugur is a minority shareholder and has no impact on the strength of the business, or its day-to-day operations," House of Fraser, of which Baugur owns one third, said in a statement. Mosaic Fashions, which owns brands such as Oasis, Warehouse, Principles and Karen Millen, concurred. "The Board of Mosaic Fashions wishes to make it clear that the news of Baugur filing for a moratorium, will in no way affect the future strength of the group or the operations of the business," the company said in a statement. Baugur has applied to the District Court in Reykjavik to enter a moratorium process, which allows it to stop paying creditors for a three week period. Baugur's statement said the moratorium application involved "Baugur Group and a number of its wholly owned subsidiaries". "This action has been taken in order to protect the Group's assets as well as the interests of all creditors," it added. If the court grants a moratorium, it will mean that the company gets an initial period of three weeks of protection from creditors, which can be extended by the court for up to six months. A supervisor would be appointed by the court who is supposed to negotiate with creditors. In the UK, Baugur's main bank Landsbanki has applied for Baugur's subsidiary BG Holdings, which holds its stakes in British retailers, to be put into administration. "This is a kick in the balls from Landsbanki and the result will be that the Brits will get some of the best companies owned by Icelanders at a very cheap price," Baugur boss Jon Asgeir Johannesson was quoted as saying by the Icelandic news website visir.is. "I am sure that Philip Green is now dancing in his living room because he will get many of our companies for next to nothing," he added. Philip Green is the billionaire owner of BHS and the Arcadia Group, which owns chains such as Burton, Topshop and Miss Selfridge. In November 2008 he bought Baugur's 28% stake in Moss Bros for £6.7m. He also visited Iceland to discuss buying some of its other UK assets. Baugur has extensive holdings in the UK retail sector, much of which it may now have to sell. "Baugur has no choice - it has to repay the banks and they are driving it," said Nick Bubb, retail analyst at Pali International. "There should be enough interest in most of its chains to attract buyers, perhaps from private equity firms," he added. Its holdings outside the UK include stakes in the Danish department stores Illum and Magasin du Nord; Souk in Sweden; and 8.6% of the Saks department store chain in the US. The company has been hit by the drying up of credit caused by the collapse of Iceland's banking sector, which has affected its ability to borrow money. Some of its shops have been hit in recent months by withdrawal of cover by credit insurers. Credit insurance is taken out by suppliers, especially to the retail sector, to insure against non-payment by the stores they are supplying. If suppliers are unable to take out such insurance, they find it even more difficult than usual to take out loans from banks. But one credit insurer has predicted that the retailers will be able to continue trading, despite Baugur's protection from creditors. A spokesperson for the credit insurer Atradius said: "[We] remain supportive of the viable businesses trading within it, notably some of the well-known names on the British High Street." "We do not foresee that Baugur's shareholding will negatively impact the ongoing trade of these businesses and anticipate the transfer of shares in an orderly fashion."